Yeah, I remember that at the shows, a lot of the other vendors would just come by my tables, and many of them were evidently checking my prices, assuming they wanted to know how much to lower their prices to compete. So I got tired of that. I made it a point to put prices on the animals as the VERY LAST thing, right before the doors opened and the public came in. When they would blatantly ask me about prices during setup, I would just tell them I didn't know yet. I was pricing things by the seat of my pants, so come back later. Personally, I never really checked anyone else's prices. I just priced them as to what I felt they were worth and would likely (hopefully) sell for. Of course, many times I was seriously wrong, and evidently felt the animals were worth more than what people wanted to pay. I remember one show when I hatched out a BUNCH of really REALLY gorgeous amelanistic Okeetee phase corns. I brought along every one of them that wasn't in shed, thinking they would sell like hotcakes at the show. How could they not? They were GORGEOUS! I priced that at $35 each, which I felt was very reasonable, based on how great they looked. Well, I didn't sell even one of them that weekend. Not a one! I even actually walked out in front of the tables to look at them to see if I was really missing something. Heck, they STILL looked gorgeous to me, but apparently not to anyone else. That really had me doubting myself in that I must not have ANY clue about what people find attractive. Never have been able to explain that one to myself. I remember doing a show in Tampa where we only sold exactly ONE snake, and ONE leopard gecko the entire weekend. Those kinds of shows are tremendous blows to your ego and feelings of self worth. But the Tampa show was often like that. You learned to not have high expectations going into that show. I think one of the last shows we did was when we discovered that the promoters were happily providing bus transportation to the walk-in public to the local casino. What the???? They are taking OUR potential customers and busing them to a casino so they can lose their snake buying money there? Seriously?? Needless to say, we dropped those shows from our yearly itinerary. We very seldom did one day shows. Just too much work and hassle doing a show to not have that Saturday night when we could relax between the two days of the show. It quickly became "two day show" or "we don't go". I just did NOT want to set up and break down on the same day for a show. Once we did a show out in San Diego, CA. Man what a fiasco that turned out to be. I felt like we were going out to the mecca of reptile breeders, and I was actually pretty antsy about going out there. We had to fly out there, as were the animals we wanted to take, and the materials for setting up our tables. So we had to travel pretty light, of course. And our overhead was really pretty high, but I had high expectations. Then the airline lost one of our boxes for several hours, and I was about ready to have a heart attack. Setting up for a show is stressful enough and this one was extremely so, even without not knowing if that box would ever show up. But it did, and cost us another trip to the airport in that rental car. Oh yeah, and then we had to ship back home everything that didn't sell. NEVER did that again. Anyway, I printed up labels for the deli cups before packing the boxes for the show, and during setup I was busily putting the new labels in preparation. Note above about the "mecca" comment. I felt I needed to be technically correct with my IDs, because some of the really big wigs in the business would likely be walking by my table. 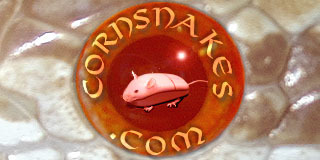 So I labeled all the corns as being "Red Rat Snakes". That IS technically correct, you see. Well, you have no idea how many times I had people looking over the deli cups, and then asking me, "Do you have any corn snakes?" I thought my head would explode several times. Of course, we did have several people look at Connie's leopard geckos and made the classic "California" comment, "Gnarly, dude!" Anyway, if it hadn't been for a guy who walked up to our table about 5 minutes before closing and purchased a pair of Costa Rican milk snakes from us, we would certainly have been in the red for that weekend. So we kinda broke even. I think. The way I looked at it, we could have just wasted all our time and effort going out to San Diego for the weekend, or on the other hand, looked at it as us getting a nearly "free" weekend in San Diego. The later thought just made it easier to swallow how that weekend turned out, I guess. BTW, after a few shows, I did some figuring, and as a result of that figuring, my normal "50% off sale" every year came into being. You see, I figured out that in most cases, the bottom line for doing most smaller shows would work out to being the same if we had just stayed home and I sold a bunch of snakes at 50 percent of their list prices. With the overhead associated and the invariable "show prices" we had to display, this pretty much worked out to being an accurate rule of thumb. So we just took that to heart and eventually stopped doing most shows, and really only doing the larger one or two each year that we did best at. But that sort of thing is a learning curve that everyone who does shows has to figure out on their own. I once had someone blast me for looking at shows as being from a commercial perspective and thought I should be happy to do shows just for the opportunity to meet and talk with people. Sure, it is nice to do that, and if I were only paying the walk-in admission fee, and only have to drive to the show, without a ton of preparation, it would certainly be a viable point of argument. I'm not sure the other party ever got my point, however. So the point of all this is, I guess, I STILL get nightmares about doing shows. So what is that telling you? It's a classic case of PTSD. Look at how much free therapy you are getting. Several years ago I went to pick up a holdback snake the breeder finally said he would sell me. When I got there his wife said she didn't know which snake it was, as they had thousands of corns there. I asked where her husband was and she said he was in the hospital because he just had a nervous breakdown. She said it probably wouldn't be a good time to ask him about snakes. I can think of a few someones who might be who you are referring to. I think there is an excellent possibility that many people in this business carry a pocketful of Valium with them, especially while at the shows. I know I had an emergency stash in my desk drawer. I would quarter a pill and just take a quarter of it to take the "edge" off of the day every now and again. I believe I still have some in that drawer. Yeah, expiration date on the box says "07 2007". Of course, haven't touched the stuff since retiring. I remember one day, I think the year when I had 8,000 babies hatching out, that I was standing in the back room after looking at all the egg laying containers with the red colored dots on them, indicating that they needed to have the babies set up in their individual deli cups. I was looking at an enormous amount of work. I was standing in the back room and actually felt my body start shaking. I was nearly overcome with the urge to run out the door into the woods, screaming. But I just pulled myself together, telling myself I didn't have time for that. I had work to do, and if I didn't get to it, animals were going to die. That was always the enormous burden of doing this sort of stuff. If you didn't do the work, as quickly as it needed to be done, things would die. It was an unbelievable relief to feel that lifted off my shoulders when we retired. I've often thought about offering my services to friends who raise thousands of hatchlings every year. But that is a commitment you can't take lightly. If you say you are going to be there to help set up the deli's, or feed, or clean containers, you better make sure you will be there. So it used to be thought that the human body had about 10 times as many microbes as human cells. That number was revised in 2016 and now we are believed to be about half and half. Half of your body is living organisms other than yourself. It's called the microbiome, and it controls your health, particularly your immune system! So I am a Borg? I was concerned about bacteria on the outside trying to get in, now I have to worry about bacteria on the inside trying to get out, or doing some damage while in there. Another sleepless night coming up. Hope there's something good on YouTube. So when you take medication for some bug you have come down with, how much of your microbiome are you killing off? I would think a 50 percent collateral damage to your body would be pretty significant to you. Well, a lot. That's the reason you should be careful to only take antibiotics when absolutely necessary, and to "feed" and replenish the good bacteria if you have to take antibiotics. Foods that contain a ton of natural good bacteria (probiotics) are fermented foods like kefir, kimchi, kombucha, sauerkraut and other fermented vegetables (super easy and fun to make yourself!). These have millions time more probiotics, and species of bacteria, than any powdered probiotic you can take. I got REALLY into the whole microbiome thing when I had a foster dog with "allergies." I learned a ton about the microbiome and how it controls the immune system, and how to protect and restore it. Do you remember Janine Evans (Diamond Lil on this site), the RN from England, who was into raw feeding her dogs light years before anyone else here? I started feeding raw foods to my dogs in about 2014, and have ever since, and have studied so much about how the diet they eat, and what it is composed of, and even as detailed as what the animals used for feed are eating. I've also learned a lot more about vaccinations and how long they last (basically, in a dog's lifetime, nearly forever) and the actual damage overvaccinating does. For instance, a rabies shot, which is required by law, and reasonable, because it's an incurable virus, is a necessity. In Florida, we are required to vaccinate every 3 years. The vaccine, however, lasts much longer- 7 years or more. But, one wonders, does it harm the animal to just vaccinate as often as we want, whether the animal still shows antibodies or not? The reason the changed the vaccination site on cats from the neck to the tail is because when the cat develops cancer from the vaccine, they can amputate the tail! So there's a trial going on right now that shows that dogs given two rabies shots still have antibodies 5 years later, and the research dogs are being analyzed at 6.5 and 7 years now, with the goal of extending the rabies vaccine requirement out to 5 years, and then 7 years. I was spot cleaning snake containers today, and for the 4th time one of my corns latched on to my teeshirt. One tongue flick and that was it, they just quickly bit the shirt. Today the corn actually coiled up on my shirt and it took a little time to get her to release. I know my shirt doesn't smell like a mouse, and apparently I don't either, since the corn grabbed the shirt and not my hand. I sniffed the shirt and it did have an odor from the dryer sheets we use. I got to thinking, if the snakes like the smell, kind of like perfume, I may be able to use that to my advantage with hatchlings that are reluctant feeders. Of course I wanted to check the ingredients before I tried rubbing a pinkie on a dryer sheet. What I found out was the companies only list the ingredients as cationic softeners and perfume. But as I searched further I found out the companies can put whatever they want in those dryer sheets. There is no apparent regulation. I found one analysis of the dryer sheets that had a whole list of carcinogens, including alpha terpineol,benzyl alcohol,camphor,chloroform,ethyl acetate, linalool, pentane, and what are called quaternary ammonium cations. Not only do I want to keep the corns away from that stuff, I was wondering if we should be using those dryer sheets at all. I found several articles expressing the dangers of using them. Now it looks like I have something else to worry about, but thank the snakes for pointing it out. Hopefully, it is the perfume scent that they like, and I can experiment with that.